Beat the Champ, the Mountain Goats' 15th album, will be out April 7, 2015 on Merge Records. For the past two decades, John Darnielle has always shown an ability to take interesting subjects and characters and weave them into affecting songs under the moniker the Mountain Goats. Fans of Darnielle have come to know and love tracks highlighting anything from a pair of Texas teens with metal dreams, the downfall of a star high school running back, and, of course, the doomed alpha couple. Darnielle has a new theme for 2015, however, and that is professional wrestling. For those who may be confused by that last sentence, I mean the fake sport featuring sparsely-clothed people fighting each other in ridiculous fashion. 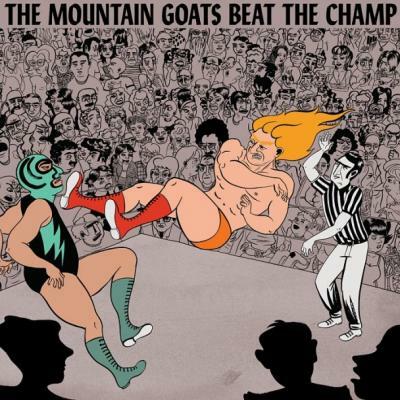 Beat the Champ is the first album from the Mountain Goats since 2012, a rather long time for a band that has put out 15 full-length releases in 20 years, although Darnielle once claimed in an Erie Reader interview that he doesn't think he's written a ton of songs (I would disagree). Now the songwriter is channeling a form of entertainemnt that enchanted him in his youth, something Darnielle writes about on the Merge Records web page for the upcoming album. "Beat the Champ is about professional wrestling, which was an avenue of escape for me when I was a kid. Wrestling was low-budget working class entertainment back then, strictly UHF material. It was cheap theater. You had to bring your imagination to the proceedings and you got paid back double. I wrote these songs to re-immerse myself in the blood and fire of the visions that spoke to me as a child, and to see what more there might be in them now that I'm grown." Even with the lengthy two-and-a-half-year gap between 2012's Transcendental Youth and Beat the Champ (someone tell that to Modest Mouse and The Wrens), it's pretty impressive that Darnielle's been able to put together another album for early 2015, given that he's likely pretty busy with raising his first child and having put out a National Book Award-nominated debut novel in Wolf in White Van. What's more is that Darnielle and Merge are really committing to the whole professional wrestling theme (as they should, because it's awesome) with the Leela Corman's cover art and the gold-and-green-championship belt deluxe LPs. Naturally, some tour dates were announced, with an April 23 date at Mr. Smalls marking the closest stop to Erie. Beat the Champ before won't be released until April 7 on Merge Records, but you can listen to Darnielle sing about one of his childhood heroes in "The Legend of Chavo Guerrero" below.